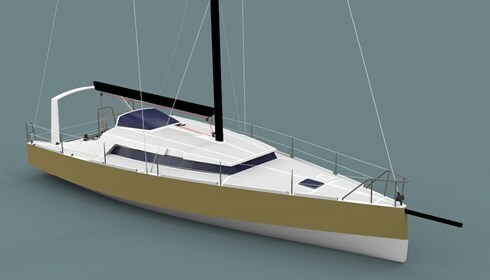 This design evolved following discussions with the client early in 2013 and is based on the hull platform of the Owen Clarke Generation 3 Class 40 as seen on 40 Degrees II and Cinnamon Girl. This concept can be best defined as a high latitude performance orientated blue water explorer yacht, as her cruising ground will be largely centred on Southern Chile and the extremities of South America. The client had some very specific requirements and specifications for the vessel, not least the requirement for shallow draft. The first part of the design phase was to analyse the existing Class 40 hull for its suitability and to calculate the mass of the additional cruising fit-out and cruising payload. Fortunately the characteristics of an open type hull very much suit a cruising design in two significant ways: a) the hull is naturally high volume, excellent in terms of space for cruising, b) the large waterplane means that the yacht has far less sinkage (the depth the hull sinks when cruising payload is added) than a conventional hull form. For this client the ability to sail quickly from one cruising ground to another was also of high consideration due to the length of the Chilean coast, distances between harbours and unpredictability of the weather. The main design features required were a more easily managed sail plan than the existing Class 40, lifting keel capability with the ability to beach the boat, dedicated anchor launch and stowage system and enhanced mooring points all round, two double sleeping cabins, saloon seating for four and a fully equipped galley. All this combined with the usual trappings of cruising boat life including heating, refrigeration and pressurised hot and cold water systems meant that some adjustments were required to the existing hull shape to ensure that the high levels of sailing performance commensurate with an Owen Clarke Design cruising boat were maintained. Designed for a more relaxed pace than the typical racing Class 40 and with a cruising displacement of 6500kg compared to the minimum racing displacement for a Class 40 of around the 5200kg. The sail plan foregoes the typical fully roached flat top main of around 67sqm for a more modest IRC type high performance mainsail of 54sqm, further sail selection has been developed directly with the client and comprises of furling genoa and staysails on anti-torque stays along with sprit mounted asymmetric and code sails. The 1.22m bowsprit retracts into a tube within the anchor locker compartment when not in use. The deck layout is more cruising boat orientated with a single offset pit winch at the forward end of the cockpit under the expansive cuddy, primary and secondary winches to the cockpit sides and within reach of the helm, central helm seat with wheel steering driving through cables to the twin rudders. The aft deck has been sized to allow an inflated tender to be stowed when cruising and retractable cleats for stern to mooring. Large hatches are located in the aft deck for access to the aft compartment and in the central cockpit floor to allow access to the commodious lazarette compartment to starboard. In here one finds stowage space for larger loose items and sails along with access to the main engine, water ballast system and heating units. Access to this compartment is normally gained from the main saloon. As one can see, the final look has changed significantly as the design developed and while the layout remained the same, a 270 degree wrap around window coachroof has been designed and engineered for the yacht. Keel Fabricated high tensile lifting steel fin with composite fairings. Steering Titanium rudder stocks. Cable controlled single central wheel. Rig Two spreader, carbon fractional rig with slab reefing carbon boom. Construction Epoxy, Carbon, S and E Glass on foam core. Deck systems Harken hardware and winches. Manually deployed anchor arm. The concept and the sailing characteristics have been defined by the client based on his previous circumnavigation experiences and his extended cruising experience of Patagonia. This is the backyard of the roaring forties and any vessel operating in this area has to be able to withstand the extreme forces of nature that can be encountered here. The hull is predominantly Epoxy with S glass on a foam core with sacrificial bow zone and watertight compartments fore and aft. To reduce weight the decks are predominantly Epoxy with Carbon on a foam core, all chain plates are carbon composite. 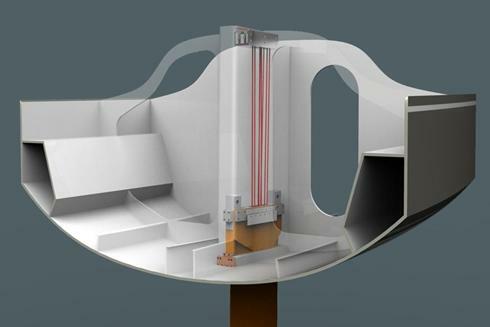 The manually operated lifting keel is high tensile steel with composite fore and aft fairings, fitted and operated from within a composite keel case. 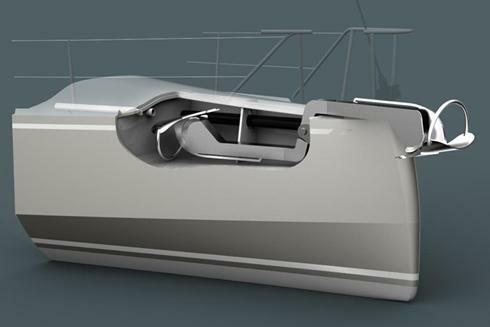 The Maximum lift of the keel is 1.54m giving a draught with the keel up of 1.05m and with keel down of just under 2.6m. The rudder stocks are titanium and the standard rudder profiles have been modified to allow for beaching with the keel up. Construction is well under way, although on a very slow schedule imposed by the owner's commitments to other work. The hull has been completed and is turned the right way, with interior structure in, mast and keel delivered but as of December 2018, still a long way from completion.